Erol Ozan is a writer, scientist, and professor of information technology at East Carolina University. He has degrees in electrical engineering, applied physics, and engineering management. In his novel Talus, Ozan writes “some beautiful paths can’t be discovered without getting lost.” At first, this may simply sound like a cliche phrase meant to sound deep, but it revels much more upon closer inspection. For thousands of years, humans have connected moments of despair to the discovery of great things. Our most popular legends, fictional stories (think Star Wars), and many of our religious beliefs revolve around heroes who leave the safety of their homes only to find themselves lost and afraid. After a great struggle, they return to civilization, sharing a message of hope and wisdom. But this pattern is not limited to fantastic worlds or ancient times. The biographies of today’s most successful people are filled with stories that fit this pattern—personal turmoil followed by great achievements. Before publishing her first Harry Potter book, J.K. Rowling was an unemployed, broke, single mother. Today she is responsible for authoring the best selling book series in history, stories which have brought joy to countless children around the world. At age 23, Oprah Winfrey was fired from her local news anchor position and unsure as to what to do next. Thirty plus years later, she uses the power she gained through a successful media career to give back to the African American community and inspire positive change throughout society. 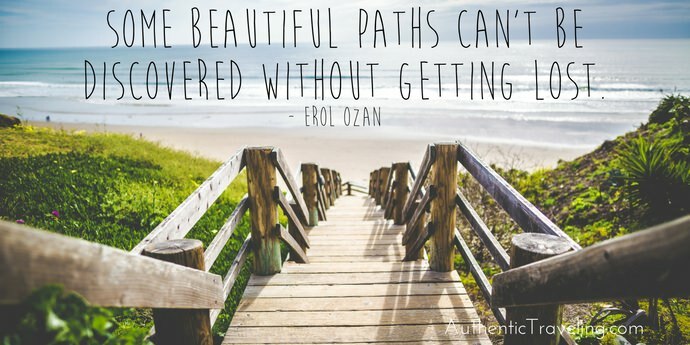 Ozan’s quote is also relevant for travelers. While most trips don’t involve existential crises, you may find yourself in a situation that is confusing and challenging. Perhaps you’ve gotten horribly ill while traveling alone in a foreign country, and you have to rely on the care of total strangers to regain your strength. Maybe you’re find yourself having to explain your political beliefs to a group of local fisherman whose worldview is not only different, but borderline hostile to yours. You never know where a life-altering conversation can happen. Whatever the circumstances, I’ve learned through personal experience that difficult travel moments—however uncomfortable they initially may be—are almost always beneficial. In fact, I now go out of my way to place myself in settings that force me to rethink how I live, what I believe, and how I act. Next time you have the opportunity to stray from your ordinary path in life, do it. You never know what wonderful things lay outside the borders of the everyday until you explore for yourself.